MLB dropped the hammer on those heavily involved in the bench-clearing brawl between the Pittsburgh Pirates and Cincinnati Reds on Sunday. Pirates starter Chris Archer has been suspended for five games and handed an undisclosed fine for inciting the brawl by throwing a pitch at Derek Dietrich. Meanwhile, Reds outfielder Yasiel Puig was issued a two-game suspension and given an undisclosed fine for throwing punches during the fracas. Reds manager David Bell received a one-game suspension and a fine for his aggressive actions during the fight. All suspensions are effective as of Tuesday, with Bell serving his ban against the the Miami Marlins. Tempers flared at the top of the fourth inning when Archer's errant throw to Dietrich went behind him. That caused Bell to storm out of the dugout, prompting the benches to clear. In Dietrich's previous at-bat, his two-run homer in the second inning rubbed Archer up the wrong way after he stood in the box and watched the ball go out of the park. 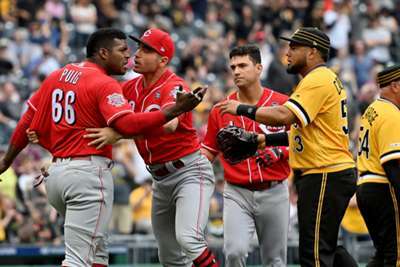 The brawl caused Puig, Bell, Reds pitcher Amir Garrett and Pirates relievers Keone Kela and Felipe Vazquez to be ejected from the game.